If you want fireworks on the Fourth, then fireworks on the Fourth you'll get. We scoured the Internet for the details on the local displays and parades you won't want to miss, no matter where you live. Best of all, most viewings are free. While not on July 4, we'd be remiss not to mention LaRosa's Balloon Glow at Coney Island (6201 Kellogg Avenue), taking place the day before. Pay for parking ($12) but skip the park (and the crowds) to view the glowing hot air balloons at 8 p.m., followed by a fireworks display over Lake Como at 10 p.m., all from the comfort of your car. Head to New Richmond for its Freedom Fest, taking place July 3-4 on the riverfront near Front Street. There you'll find a car show, live music, vendors, rides, food and drink, and a fireworks display on the holiday proper at 10 p.m.
On July 3, Oxford holds its Freedom Festival at the Oxford Community Park (6801 Fairfield Road), featuring inflatables, games, a hot air balloon, a rock climbing wall and more. The event is free, but there is a $5 per car fee at the park. Kings Island (6300 Kings Island Drive) holds its annual 4th of July Spectacular, featuring a 20 minute-long firework display. Members of the military get free admission to the park July 1-4. On July 4 at Ault Park (5090 Observatory Circle), you'll find a day-long festival filled with food, live music and of course, fireworks that start at 10 p.m.
Northside's July 4 parade is not your typical processional. You'll find plenty of red, white and blue, sure, but also plenty of fun and funky floats and costumes (just check out last year's photos). The parade starts at noon on Hamilton Avenue and ends at Hoffner Park (4101 Hamilton Avenue) where you'll find the Rock 'N Roll Carnival, featuring food, drink and live music. The Cincinnati Pops play Riverbend Music Center (6295 Kellogg Avenue) at 8 p.m. and will be joined by the U.S. Army Chorus for performances of songs like "America the Beautiful" and "Stars and Stripes Forever." Fireworks take place at 10 p.m. Tickets are $5 for active or retired military; $15 for everyone else. The amusement park Stricker's Grove (11490 Hamilton Cleves Road) will hold its Fourth of July Celebration offering free admission (pay for rides, plus $5 parking) with fireworks at 10 p.m.
At Red, White and Blue Ash in Summit Park (4335 Glendale Milford Road) you can expect live music by none other than John Waite, Pat Benatar and Neil Giraldo, plus a fireworks display at 10 p.m. While you can set up as early as 7 a.m. for this free event, there are some rules you must abide by (PDF). Finally, if fireworks aren't your thing, Washington Park (1230 Elm Street) screens the 1996 film "Independence Day" starring Will Smith, for free starting at 9 p.m.
Florence will celebrate early on July 3 with a day of food, games, music and fireworks at UC Health Stadium (7950 Freedom Way, Florence, KY) starting at 4 p.m. The band DV8 plays. Starting at 10:30 a.m. July 4, Fort Thomas kicks off its Independence Day Celebration with a parade that marches from Highlands High School to Tower Park (900 S Ft Thomas Avenue), where a festival will take place featuring games, rides and food, plus an antique car show, sport tournaments, and live music by Soul Pushers, Motherfolk and Blessid Union of Souls. 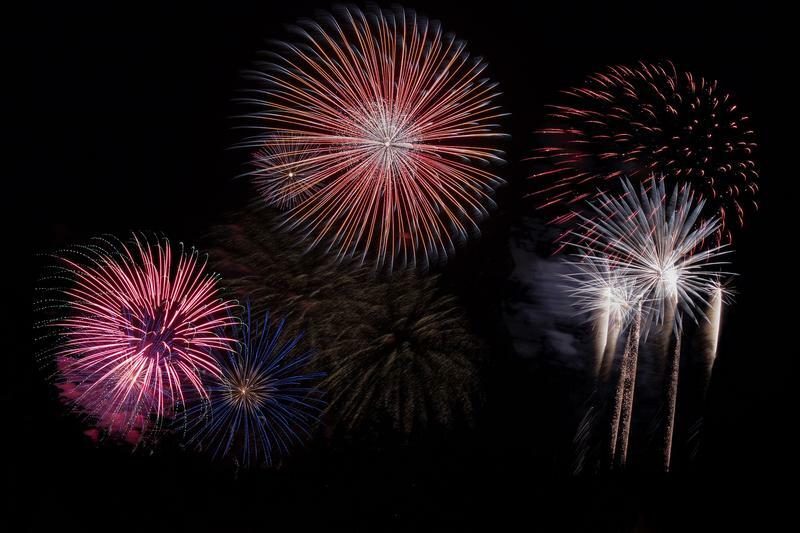 Fireworks shoot off at 10 p.m.
Edgewood's July 4th Extravaganza starts with a 5k race at 7:30 a.m.; a parade at 9:30 a.m.; and finally, a free concert by the classic rock band Red Idle at Freedom Park (550 Freedom Park Drive) at 7 p.m.
Cambridge City celebrates a day early on July 3 with a fireworks display at Creitz Park starting at dusk. The city of Greendale celebrates with a variety of events at Greedale Cabin within Greendale Park (827 Nowlin Avenue), including a kids bike parade, a kids fishing derby, a 5k, and of course, fireworks at dusk. Hidden Valley in Lawrenceburg shoots off fireworks over its lake beginning at dusk. Hagerstown's fireworks display takes place at 9:30 p.m. at the Hagerstown Airport (999 Washington Street).